Let it be AMG, Lumma, MTM, Techart, Brabus or anyone else, tuners are never satisfied by the work of automakers. 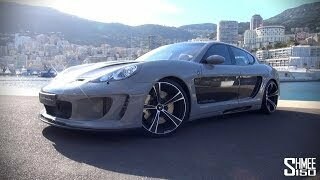 This time the model turned to be Porsche 970 Panamera and tuner interested here is Gemballa Mistrale. 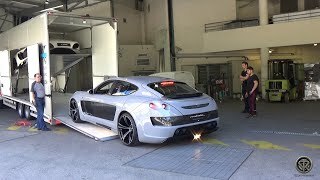 We need to mention here some word of appreciation for the commendable work they portrayed while tuning the 30 pieces of Gemballa Mistrale Porsche 970 Panamera 2014. Let us have a look at the review of Gemballa Mistrale Porsche 970 Panamera 2014 to know more about it. There isn’t just one side of coin that makes the Gemballa Mistrale Porsche 970 Panamera 2014 special. Named after the fast blowing wind ‘Mistrale’, tuner will be creating just 30 pieces of this model and each one to lead the streets. Gemballa used bespoke carbon fiber for bodywork; this didn’t just bring better looks but also helped the tuner to decrease the weight of Gemballa Mistrale Porsche 970 Panamera 2014. The lightweight model is based on aerodynamic carbon-fiber components which provide this 4-seater model with better performance ability. Looking close you’ll realize that the side profile holds its basic roots somewhere in the Avalanche while the new four circular exhaust outlets are entirely unique and commendably splatter the sportiness any speed lover would seek for. Beneath the Gemballa Mistrale Porsche 970 Panamera 2014 hood you’ll find a great hike in its total output. Now instead of 500 hp the engine produces total output of 721 hp and peak torque of 955 nm. Not only this the top speed of Gemballa Mistrale Porsche 970 Panamera 2014 can now touch the mark of over 205 mph and can easily knock the 0-62 mph sprint in just 3.6 seconds.